“Dangerous” Davies was created by Leslie Thomas and first appeared in Thomas’ novel Dangerous Davies: The Last Detective which was published in 1976 (three further books would follow – in 1987, 1993 and 1997). Davies’ first small-screen appearance came in 1981, in an adaptation of Thomas’ 1976 novel which saw Bernard Cribbins play Davies and Bill Maynard appear as Mod. 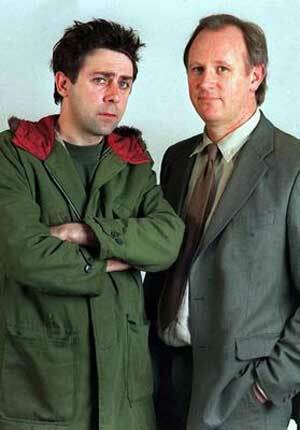 We then fast-forward some twenty or more years to The Last Detective which starred Peter Davison and Sean Hughes and ran for four series between 2003 and 2007. Peter Davison has always had a tendency to play somewhat bewildered everymen, so was perfectly cast as Davies. Dangerous Davies (an ironic nickname, as he’s anything but) is an old school copper who’s genuinely interested in people and is content to listen to what they have to say and help if he can. This earns him barely disguised contempt from his younger colleagues who are much more interested in just nicking villains. There’s no solace to be gained from his superior, DI Aspinall (Rob Spendlove), either. It’s Aspinall who tags him the Last Detective – i.e. he’d always be the last detective chosen to investigate any important case. So Davies ends up with the jobs nobody else wants to tackle – which is how he stumbles across a twenty year-old unsolved missing persons case and decides, completely on his own authority, to re-investigate it. Josie (Joanne Froggatt) was a seventeen year-old girl who went missing in 1982 and hasn’t been seen since. When leafing through files relating to a connected case, Davies becomes intrigued by the story and decides to take a look at it, although the potential consequences of reopening such an old investigation are quickly spelled out. Josie’s mother (played by Rachel Davies) has never got over her disappearance and there’s the uncomfortable suggestion that if Davies doesn’t come up with anything he’ll simply have raised her hopes only to have them dashed again. Talking about Josie also impacts on her sister Celia (also played by Joanne Froggatt). Ceila was conceived shortly after Josie went missing and has lived her whole life knowing that in some respects she’s a replacement for her. Her lack of identity and also her relationship with Davies (which shifts between vulnerability and hardness) is a key part of the story. The picture of exactly what sort of person Josie was is slowly built up as Davies questions the people closest to her. As he meets each witness we see a flashback to events back in 1982 and they help to bring her character into sharper focus. There’s several potential suspects, although the mystery element of the story is fairly weak since the culprit is somebody that was never even considered. This can’t help but feel like a bit of a cheat. As Davies continues to uncover the facts he finds a useful sounding board in his friend Mod (Sean Hughes). With Davies seemingly shunned by his colleagues, Mod effectively becomes his partner and is always on hand to listen to his theories. The notion that Davies could operate with no supervision might have been more likely when the book was originally published but it does strain credibility a little in 2003. Still, television doesn’t have to be real to life so it’s best just to go with the flow and just enjoy the comic banter between Davison and Hughes. The pilot also introduces us to Davies’ estranged wife, Julie (Emma Amos). If his career is a bit of a disaster then it’s obvious that his marriage was as well. This does sort of ram home the point that he’s a loser – but thankfully Davison is able to bring some light to proceedings (otherwise things would be even more depressing than they are). But there is a dark tone to this story. Although Josie’s mother tells Davies that all she wants is closure – if she knew Josie’s fate then she could find some sort of peace – the solution to the mystery isn’t one that provides anybody with a neat, happy ending. Should Davies have just left well alone? At one point he does confess that he’s possibly only continuing the investigation because he wants to prove to himself that he can solve it (rather than considering what the consequences of his actions will be). David Troughton, who had starred alongside Davison in A Very Peculiar Practice, makes a welcome guest-appearance as Sergeant Yardley. Like Davies, he’s an old-fashioned copper and the pair seem to have a certain connection. Rachel Davies and Leslie Schofield both impress as Josie’s parents, but the stand-out performance comes from Joanne Froggatt as Josie/Celia. Now a familiar face, thanks to a regular role in Downton Abbey, she had still managed to rack up an impressive list of credits between her television debut in 1996 (in an episode of The Bill) and this production. Thanks in part to Peter Davison’s unshowy performance, this is a strong opener. Richard Harris’ adaptation skillfully manages to take the best from the novel whilst presenting a less comedic adaption than the 1981 version. Rather bizarrely, the series isn’t available as a R2 DVD, although R1s and R4s are available (it’s also just begun a rerun on the UK channel Drama) so it’s worth checking out if you can find it.